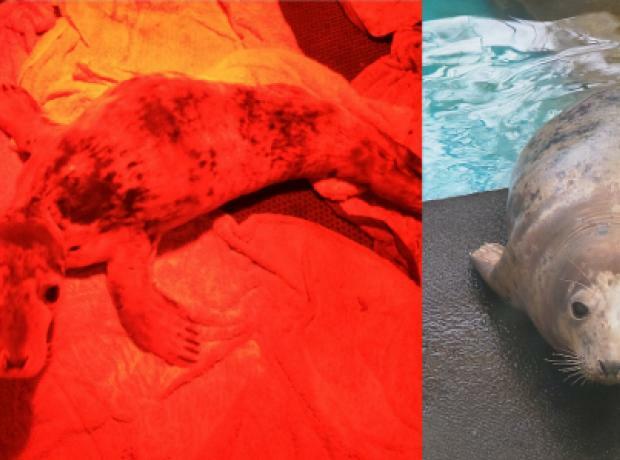 Nearly two months on and Bonnie the injured seal pup who was found close to death certainly isn't as skinny any more. Bonnie since the GSPCA rescued her from the base of a cliff on the south coast towards the end of January despite an early struggle to get weight on her has now nearly doubled her size. At just 14kgs when she was carried off the beach and up a steep cliff was extremely weak and emaciated. Today she was weighed and totals just short of 26kgs which the team at the GSPCA are overwhelmed with joy in her progress. Bonnie the seal pup today certainly seemed to be enjoying her lunch in the spring time sunshine. Bonnie continues to put on weight and although now has access to two pools seems to enjoy the smaller of the two which was the first she was introduced too. Bonnie the grey seal pup at the GSPCA continues to make good progress and today she received a room upgrade at the GSPCA. Having been slowly introduced to a small pool in the wildlife unit at the Animal Shelter in St Andrews she now has a choice of two. Both pools have viewing through reflective glass to minimise her contact and even a feeding tube to help reduce her interaction with people. Bonnie is still more than 15kg in weight away from being released but the team are pleased with her rehabilitation to date. Today we are pleased to announce that Bonnie the grey seal pup took her first dip in one of our rehabilitation pools. Bonnie who was rescued close to death last month has been improving daily at the GSPCA and with her weight gaining and health improving the team decided to let her experience her first trip outside since she was rescued. Geoff George GSPCA Animal Collection Officer and main seal carer said "It's been over a month since we rescued Bonnie the grey seal pup and she has been doing better than we could have hoped."